The fact that I didn’t post something for a while has nothing to do with me giving up my astrophotography hobby. Better yet, it causes me to have a boatload of astrophotos to show you. February appears to have been quite the productive month for me, more on that later. 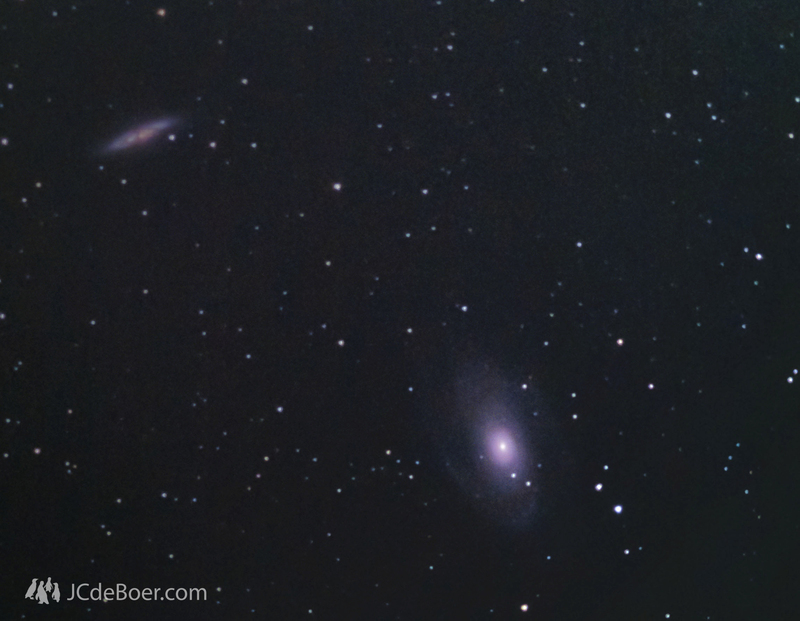 First of all, I got a pretty decent shot of the galaxy couple M81 and M82. It shows some red detail in M82 (top left) and 2 distinct dust lanes around M81. They do not just appear close in this image, they are actually quite close to each other. Close enough in fact, for the galactic gravitational fields to enhance star formation in the other galaxy. Now, most of the images I post here are stacks that represent total exposure times of 10 minutes or more. But of my favourite target, the Great Nebula in Orion, I got only some 10 decent frames of 30 seconds each. When I realised this, shooting a pile of good M42 photos became my top telescope-priority. The image below is the result of stacking 40 30-second photos and shows some really cool detail in the dust clouds. Also, a faint blue bow is noticably which marks the top of the entire nebula. In the dark region between the bright nebula and the upper blue bow is filled with red, even fainter gas clouds. Longer exposure times will probably reveal more of this. 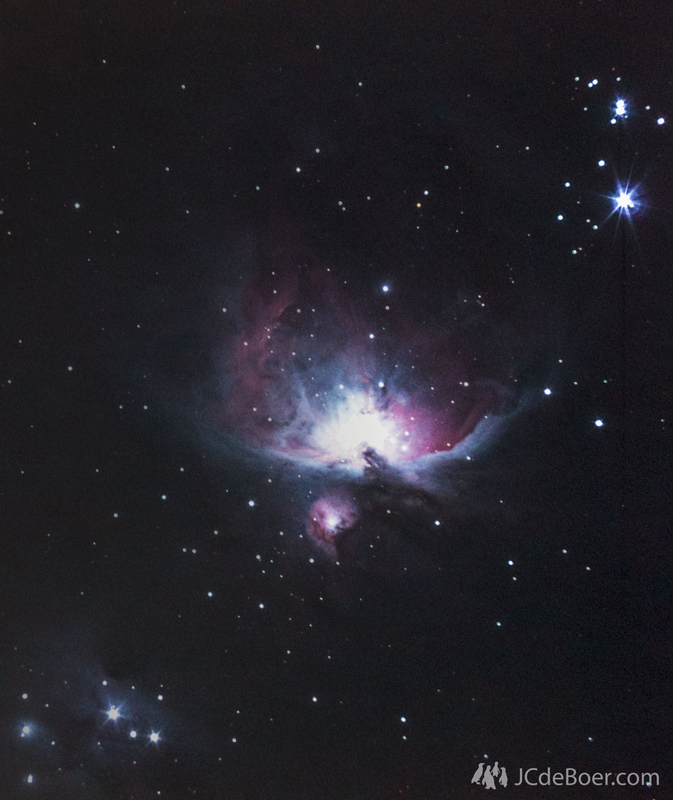 My best M42 so far. If your screen is bright, or you look at it from an angle, you can even make out the top bow. In my previous post, I showed you my first photo of the Flame and Horsehead nebula. I figured that if I used my f10 telescope, I would get a more detailed view of the small horsehead feature. 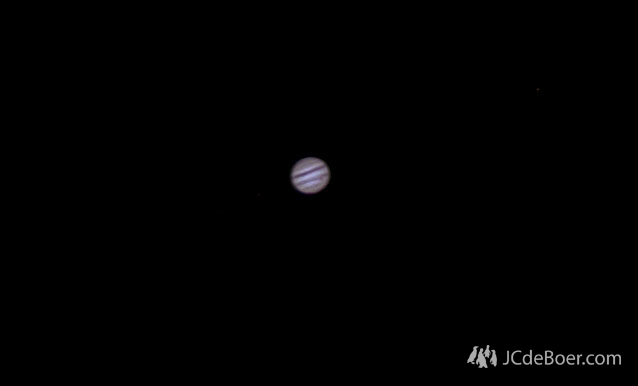 Sadly, I didn’t manage to get a good image of the Horsehead Nebula, but I did get a cool Jupiter. Since I haven’t had my camera attached to my f10 with Jupiter high in the night skies, I decided to give it a go and actually captured Jupiter’s Great Red Spot (bottom right of the planet, in the red belt). 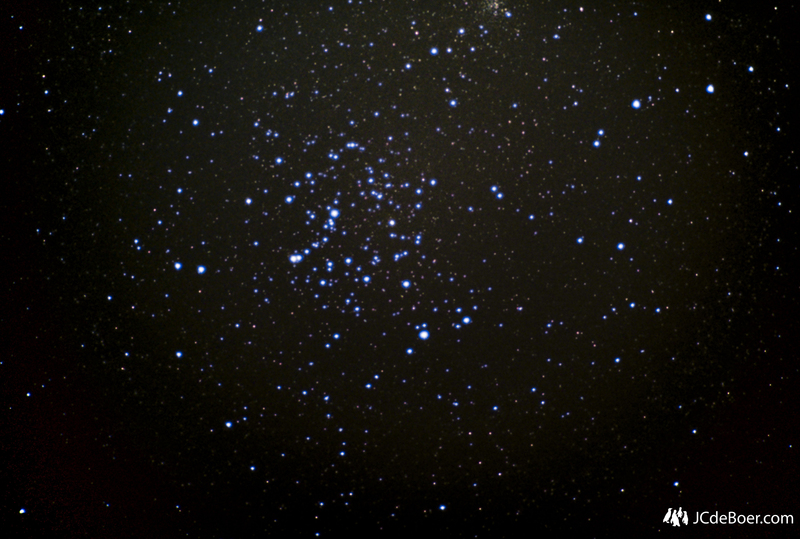 I also tried to capture M35, which also didn’t turn out very great, like the Horsehead Nebula. I think my light pollution filter doesn’t work very well with the optics in the f10. But as this image is already way better than what I got from the Horsehead Nebula and it shows a lot of brilliant stars, why not post it here right? After 2 weeks of constant cloud cover, a few days ago I got the opportunity to take some shots between pathes of fast floating clouds. The allmost full moon gave my photos a small gradient, which became a big gradient after stretching the intensity levels. 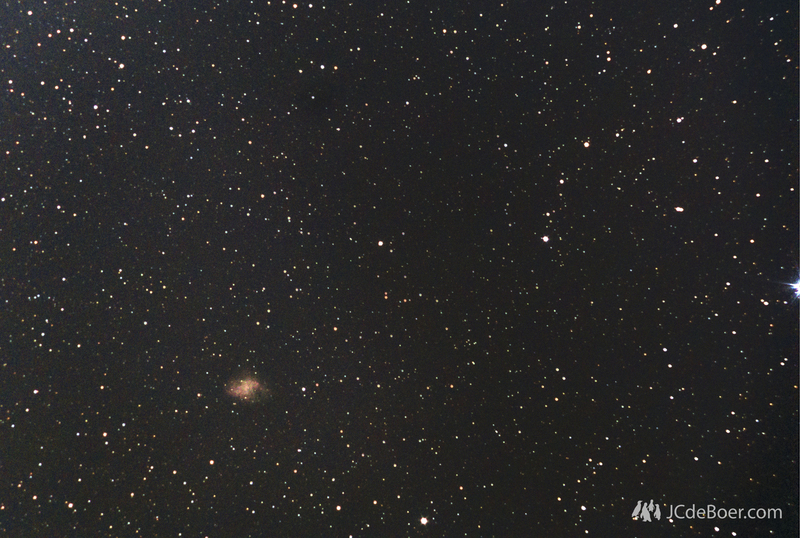 Nevertheless I got a quite cool image of M1; the Crab Nebula. I especially like how star-littered the image is and that the nebula itself is a remnant of a supernova explosion in the year 1054. M1; the Crab Nebula. A supernova remnant from an explosion in 1054. 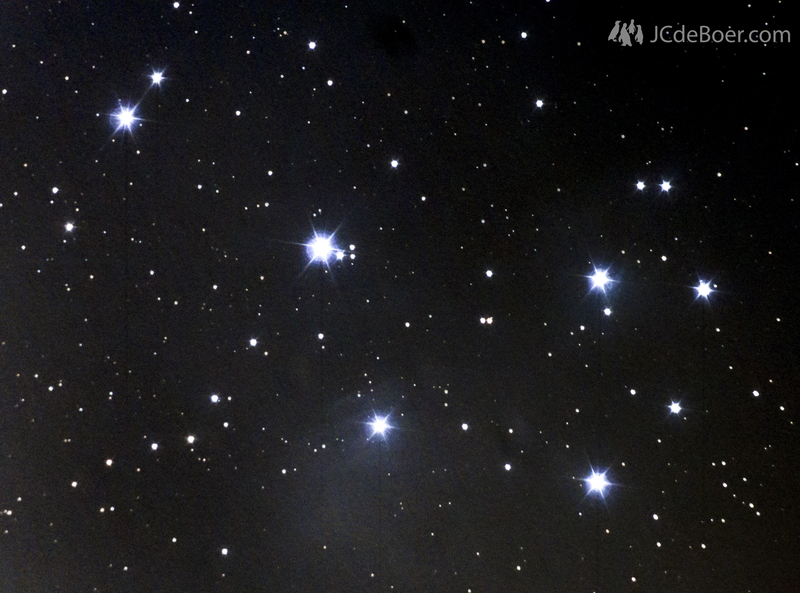 Another image I took was one of the Pleiades. 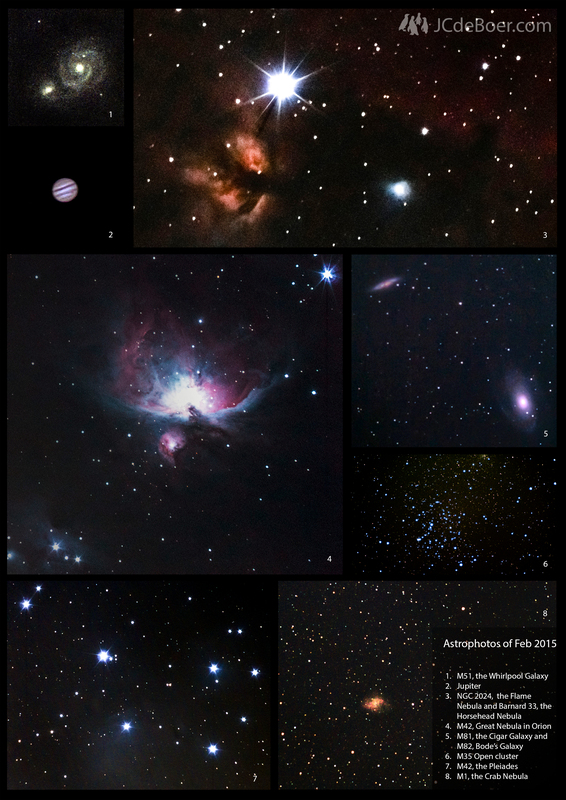 More 30 second images and the use of a light pollution filter gave me better results than before. More surrounding dust clouds are apparent and I also like how the optics cause bright circles around the stars that translate with the position in the image. If you recall that I also captured M51 and the Flame and Horsehead Nebulae earlier this month, you probably figure that all the photos together would make a great poster. At least, that’s what I did… So here it is: The first JCdeBoer.com-poster-of-the-month! This entry was posted in Astronomy, Astrophotography and tagged astronomy, astrophotography, galaxies, Globular Cluster, Jupiter, M1, M35, m42, m51, M81, M82, nebula, nebulae, orion nebula, Pleiades, spiral galaxy, stars, supernova remnant. Bookmark the permalink.